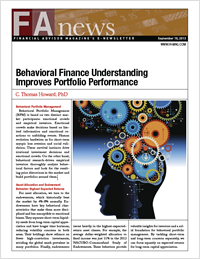 Read Dr. Howard's FA news article reprint of "Behavioral Finance Understanding Improves Portfolio Performance" for a concise introduction to Behavioral Portfolio Management. Behavioral Portfolio Management (BPM) is based on two distinct market participants: emotional crowds and empirical investors. Emotional crowds make decisions based on limited information and emotional reactions to unfolding events. Human evolution hardwires us for short-term myopic loss aversion and social validation. These survival instincts drive irrational investment decisions and emotional crowds. On the other hand, behavioral research-driven empirical investors thoroughly analyze behavioral factors and look for the resulting price distortions in the market and build portfolios around them.